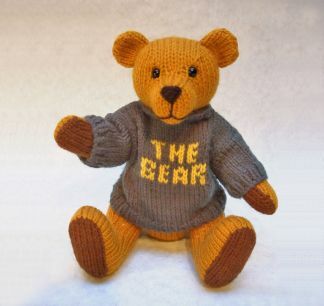 Can you bear not to knit this cuddlesome chum? You will need Of standard D.K. yarn: 40g in Gold, 25g in Bottle Green, 5g in Chocolate, and small amounts in Yellow and Black; pair of 3mm (U.K. no.11) knitting needles; 75g of washable toy stuffing; pair of 7.5mm diameter black safety teddy eyes.